The race -- 5k loops on the strand in Hermosa Beach. Each loop is run on the strand in Hermosa Beach and is fast! 1 loop for 5k and 2 loops for the 10k! The view is perfect, overlooking the ocean, just steps away! Get Ready for the Holidays and join us for some fitness and fun! 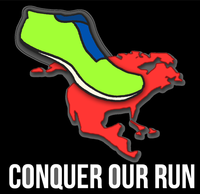 Welcome to Conquer Our Run’s iconic Hermosa Beach course. Join us for a pre-holiday run and burn some calories! The beautiful beachfront scenery and conquest friendly running environment is the perfect place to conquer your limits 1 run at a time. We dare you to join us and run further than you have before! Accept the Challenge! (NON-REFUNDABLE) on the strand in Hermosa Beach. Parking: There is plenty of free parking along the street -- Herondo or Hermosa Ave. Additional parking at Sea Lab - brings coins and/or credit card. Herondo and 8th and the Strand in Hermosa Beach. Starting line is at the furtherst south point in Hermosa Beach at the cross street of Herondo.